One of the surprises so far this award season was Carlos which won “Best Mini-Series or Motion Picture Made for Television” at the 2011 Golden Globes. The fact that it was originally produced for French television rendered it ineligible for an Academy Awards nomination, though it was viewed on movie screens in independent theaters across America. 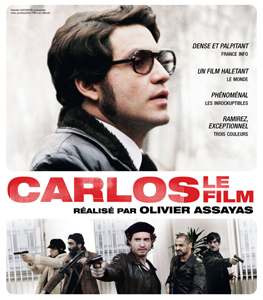 Based on the life and times of the Venezuelan revolutionary, Carlos the Jackal (i.e. Ilich Ramírez Sánchez), the miniseries/film features over eleven foreign languages, as well as a cast headed by Édgar Ramírez as Carlos. Historically, Carlos gained notoriety in 1975 for raiding the Organization of the Petroleum Exporting Countries (OPEC) headquarters in Vienna, and for years after he was considered one of the most wanted international fugitives. Screened at Cannes, the three-part miniseries received numerous accolades and went on to be acquired by the Independent Film Channel (IFC) for U.S. rights and aired on the Sundance Channel and in select theaters. But why exactly these claims? Because the Academy places the strict one-film-per-country nomination rule on foreign entries; because the choice of the final five films is arbitrary and not necessarily the best representation of all nominated films (take for instance France’s 2010 submission of Of Gods and Men which, like the Algerian nominated Outside the Law deals with periods of crisis and revolution in Algeria). Scott argues that his “concern…is more with cultural protectionism—the impulse not to conquer the rest of the world but rather to tune it out.” Cultural protectionism in opposition to, as I argue, a golden age of foreign cinema. We are actually in a period of abundance in regard to world cinema. In my opinion, the quantity of quality foreign films is at its highest point ever. Audiences, however, as urged by the industry, are pushed away from other cinemas and forced to focus on American films. When was the last time you were able to find a foreign film screened in your town (outside of major metropolitan areas like New York City, Los Angeles, San Francisco, etc.)? The problem may be rooted in overabundance. As Scott notes, “New technologies and traditions proliferate and cross-pollinate so rapidly that even a permanent resident of the international festival circuit would have trouble keeping track of it all.” But the problem also lies in our own lack of initiative to seek out foreign films other than the five the Academy nominates. The impetuous is partly on us, as consumers of film, to break out of the mold of cultural protectionism and edge our way into world cinema—to use the new technologies that are readily available to find the latest in Korean, Serbian, Japanese, and Brazilian film. The Academy Awards serves as a good entrance into a lesser-known cinema, but it remains arbitrary and represents only so much. The rest is up to us.